Great news for everyone in Europe that is interested in purchasing a ZeusMiner Scrypt ASIC as we just got a word that MinerEU has become an official distributor of Zeus Integrated Systems Limited. This means that you can now get good prices and fast shipping time from Europe with no need to pay additional (VAT) or customs taxes if you are based in the European Union. Here you can see how MinerEU will be updating the prices of the ZeusMiner Scrypt ASICs they are going to be offering depending on the week you order your miners. These are absolutely the same prices that you can get directly from Zeus, however if you are based in EU and you order from MinerEU you are not going to have to pay so much for shipping and extra costs like VAT or customs taxes. 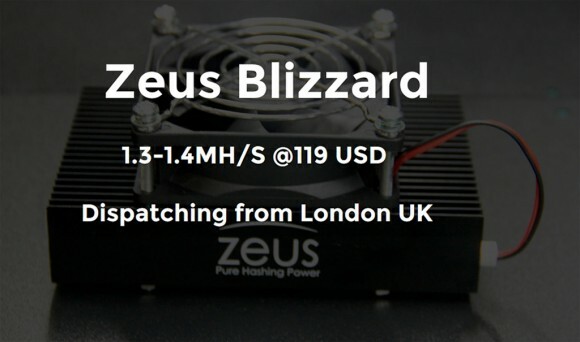 At the moment they have listed the ZeusMiner Blizard and ZeusMiner Hurricane X3 with delivery starting on June 17th, 2014 according to the information published on their website.